Protein and fibre rich healthy chocolate candies that are made from just 2 ingredients – chickpeas and chocolate. They are easy to make and inexpensive. A great fulfilling snack that’s perfect for a mid-afternoon pick me up or just before a workout. The chickpeas are dry-roasted so that they are crispy, crunchy and low-fat. This recipe is vegan, oil-free, no added sugar, gluten-free, nut-free, seed-free and suitable for nutrient dense plant-based healthy diets. Each cluster contains just under 5g of plant protein when made with very dark chocolate. This is just the base recipe and you can add any ingredients you like, such as seeds and dried fruit. I personally love this recipe with a few tablespoon of sesame seeds and dried unsweetened cherries. The sesame seeds add crunch, texture and earthiness while the dried cherries add a slightly tart sweet and sour flavour that works really well with dark chocolate. Drain and rinse the chickpeas then spread flat on an oven pan lined with greaseproof paper. Bake for about 50-60 mins, tossing every 15 mins until bone dry. Take out of the oven and place in a bowl with the chocolate and stir using the residual heat to melt. Spoon onto greaseproof paper using a dessert or tablespoon and chill to set. They will last for several weeks in an airtight container if the chickpeas are dried thoroughly in the oven. I tend to keep in the fridge and enjoy within a few days just in case I left too much moisture in the chickpeas. 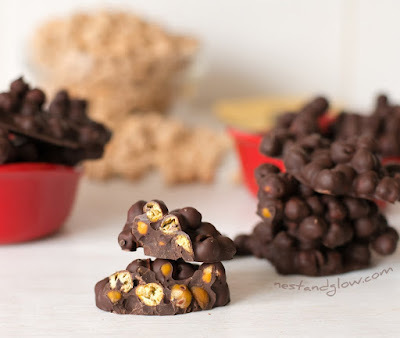 0 Response to "VEGAN 2-INGREDIENT PROTEIN CANDY – CHICKPEA AND CHOCOLATE CLUSTERS"